Useful extension for an eCommerce store to display the latest activity on the social site and show the best deals, offers and product information. 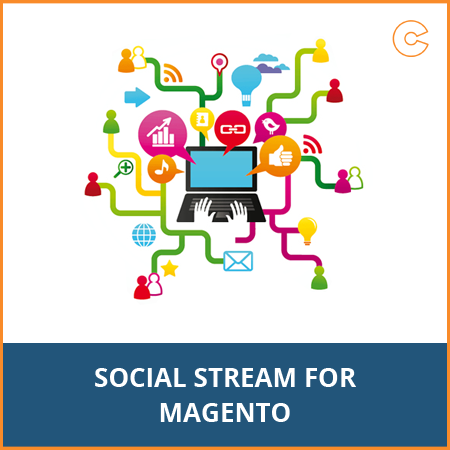 Social Stream Magento Extension is fully managed from the admin panel, you should just enable it and fill your credentials to display the Facebook post, Tweets, Google+, Pinterest, YouTube, Flickr and Tumblr activities on your Magento eCommerce store. By this extension visitors analyse your social presence and the latest deals on the site. Step 1:Unzip the ZIP archive on your local computer. Remember to place the ZIP archive in a separate folder before you unzip. Step 2: Use an FTP client to transfer all the folders in the ZIP directly to your Magento root. The existing folders will not be overwritten, it will only add new files to the folder structure. Step 4:Login to your Magento administration panel and clean / refresh your cache (System -> Cache managementand choose "Refresh"). 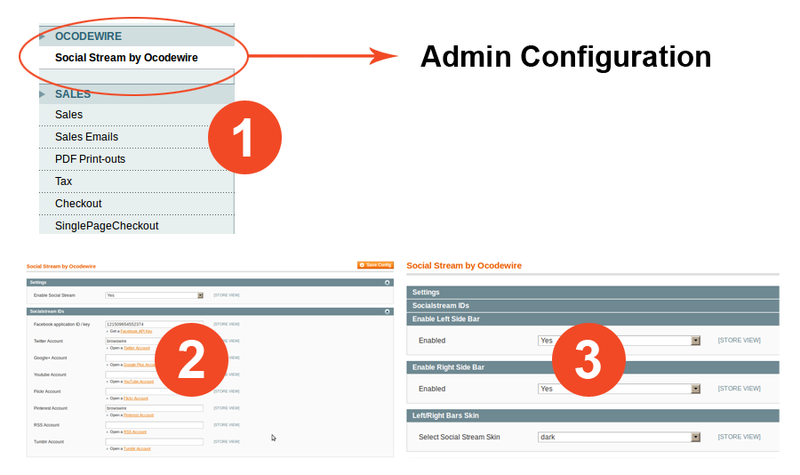 Step 5: Now Logout, and Login again to your Magento administration and navigate to the System -> Configuration. Step 6: In the left sidebar, you will see the "Social Stream By Ocodewire" Under "Ocodewire" tab. 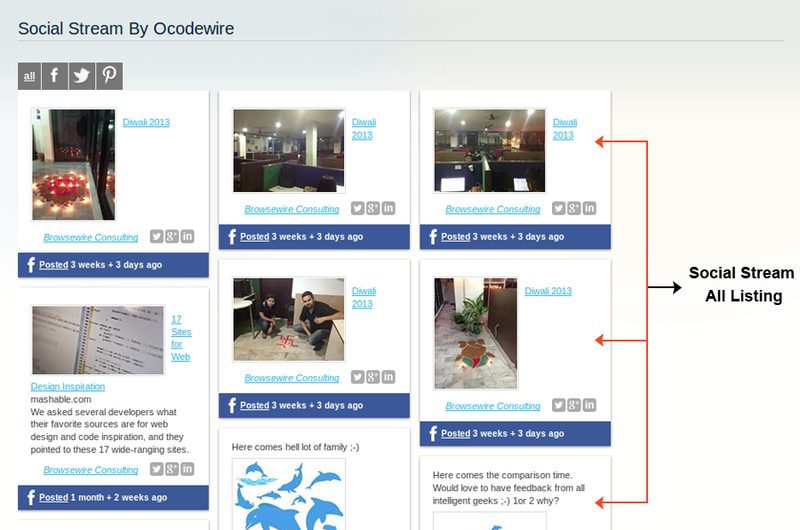 Click on "Social Stream By Ocodewire". Step 7:To enable Social Stream Extension, select "Yes" option. Step 8: Provide required API and usernames for which you want to display on the front end. Step 9: Now "Save" the Settings. Now click on "Insert" and then "Save" that page. Now "Preview" that page and select your website layout preferably. Select the "1 Column layout" for that CMS Page. Display all social media stream( Facebook, Twitter, Google+, YouTube, Flickr, Pinterest, RSS and Tumblr) together in a single place randomly. Separate field to display all social media post. Display the social stream widget on CMS page. Display social media widget on the left / right side bar by just selecting the enable or disable option. Easily display social media widget on both sides of the page. Social media share button on the post. 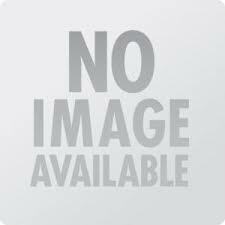 Display social post with the posted time or days. Option to select the left / right bar skin. Easily view all social streams at single place. Separately check the each social activities under their Social name. The option to share the social post on multiple social media sites. No need to edit your code. Fully managed from the admin panel. 1. You can add "Social Stream" in Left / Right side bars easily by using the "Social Stream by Ocodewire", just navigate to the under "System -> Configuration" and enable Leftside / Rightside bar Social Stream by selecting "Yes". 2. You can also change the skin color of the Left / Right sidebar widget by selecting one in Left/Right bars Skin. Note: If You are doing any changes in API then every time just clean/refresh your Magento cache. Fixed the Facebook image problem and added the API Key and API Secret with the Page Id Manageable with the admin, updated and extended admin for the Facebook, G+, Instagram and the Twitter. Added Instagram Features, updated and extended admin for the G+, Instagram and the Twitter. Q: Error 404 after installation while browsing Social Stream configuration in admin? A: If you get Error 404 after installation while browsing Social Stream configuration in the admin, please flush the cache, log out from admin and log in again. You can manage the configuration without 404 error now. Q: How to insert the Social Stream widget in to CMS page? A: To insert the Social Stream, edit the CMS page in admin and click on the insert widget button if not using the WYSIWYG editor else click on the insert widget icon. Now select the Social Stream, select your template, save the CMS page. That's it. Q: How to enable Social Stream on Left/Right Sidebar? Q: How to create the App Id on Facebook ? A: Click the following link (https://help.yahoo.com/kb/yahoo-merchant-solutions/facebook-application-sln18861.html) & learn how to create the App id on Facebook.